CRAZY DISCOUNT! Was: $89.95 Now: $29.95! 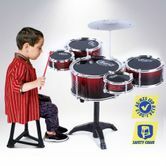 Nurture your children’s creative talents with the Jazz Drum Play Set. These little drums are designed to simulate the feel of actual drums to give kids a head start. Made from child safe materials making it ideal for young boys and girls. The Drum set helps improve their coordination skills. This is a great investment for parents looking to improve their kids creative talents and development. Painted in bright Red color to inspire creativity this set makes the perfect gift for any occasion!